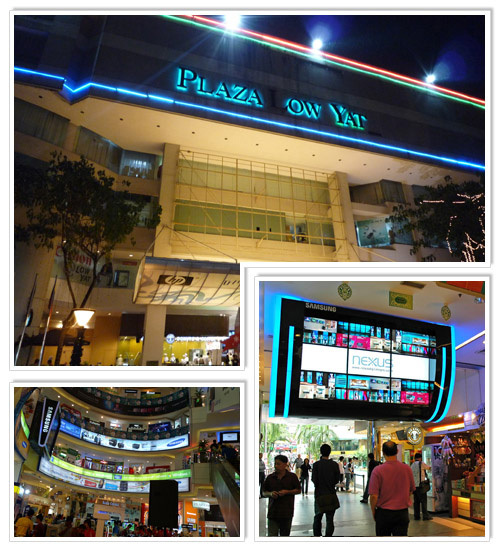 Low Yat Plaza (LYP) is one of our personal favorite malls within the Bukit Bintang area. Plaza Low Yat is the premier IT related shopping mall in Kuala Lumpur (similar to what Sim Lim Square or Funan is in Singapore). With over 350 shops spread out over 7 floors it is the biggest IT lifestyle mall in Malaysia. 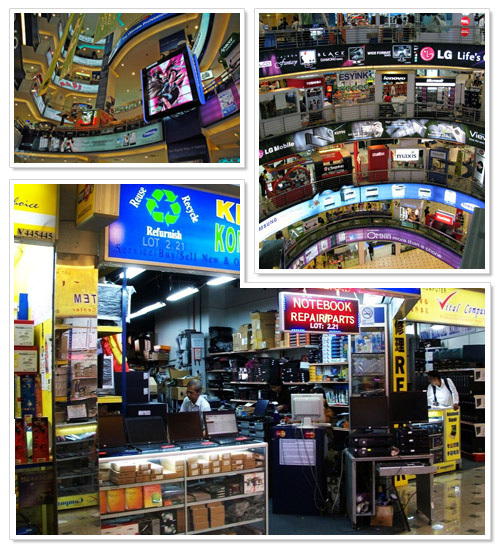 On the ground floor of Plaza Low Yat you can find a couple of great 'gadget' stores, here the latest gadgets are on display. These stores include the Mac Store, Sony, Samsung, Canon, Nikon and the Dell Concept Store. There are also a couple of camera shops and mobile phone shops on the ground floor. Here you can buy photo or video cameras, camera accessories, brand new mobile phones, prepaid telephone cards (scratch cards) and many other electronic products related to cameras and phones. In the center of the ground floor there are often showcases of popular brands; usually in weekends. One day there's Canon with their its photo camera, the other day you can have a seat in the latest Volvo or Audi import car. The first floor of the mall is mainly focused on cell phone shops; everything you could possibly need related to your phone is for sale at this floor. If you need a prepaid card, an adapter, new phone skins, new phones, cables, cell phone contracts, cell phone software; that first floor is the place to be in at LYP. The second, third and fourth floor of Plaza Low Yat are all computer related. There are many small shops (comparable to the shops at Plaza IMBI) where you can bargain for the best prices. At the fourth floor there are a couple of huge IT outlets; here you can buy complete computers or laptops for affordable prices (really cheap when you play your cards right). Every now and then you will find a camera shop or a specialty shop (that sells only one type of product) at the higher floors of Low Yat. There are a few F & B Outlet's right outside Plaza Low Yat. There is a Sushi King where you can eat sushi for affordable prices. There's also a Coffee Bean and a Starbucks, where you can have great coffee or blended (hot/cold) shakes. Also very nice is the free wireless internet at both coffee places; I used to work there on the outside terrace with my laptop when we were still living in the city center ourselves. Opposite of the Coffee Bean there is a Sushi Zanmai branch; here too you can enjoy some very nice sushi (and other Japanese dishes). Nearly opposite of the main entrance you can find the 'Bintang Walk'; a short lane with numerous restaurants and bars. The lower ground floor of the LYP shopping center contains a huge food court. However; every time we went there it wasn't that busy (which usually is not a good sign). One reason might be that we heard it is very crowded during lunch time, but not so popular for dinner. Here you can also find a couple of ATMs, which can be quite handy when you’re on a shopping spree in this mall. If you are befriended to any local Malaysians, take them along to the mall on your quest to cheap computer related products. Stay out of the way when he or she is bargaining for the best price. Locals tend to get better prices, while tourist usually pay more than needed. Visit the Low Yat website up front to find out the best deals and bargains. Often the shops publish their special offers on small paper flyers that you can find throughout the mall. Shops owners also make pdf copies of those flyers and those are being uploaded to the Hardware Zone Malaysia priceguide . Below each shop you can see the most recent date that they uploaded their latest flyer. These prices are often much lower than regular prices, but bargaining is still advisable. Bring enough cash. Especially during weekends there are long lines in front of the ATMs at the lower ground floor. On numerous occasions we saw over 30 people waiting in line to use the ATM. Bring an umbrella. It often rains at the end of the day. Low Yat Plaza has no sheltered connection to other malls. Even crossing the street to the BB Plaza rear entrance at Jalan Bulan will leave you soaking wet. From the rear entrance of Plaza Low Yat you can exit the mall and walk directly to the pedestrian bridge to get to Berjaya Times Square; this is a shortcut that saves you about 5 minutes. This exit can be found next to Kampung Melayu restaurant. Make sure you ask about warrantee and guarantee up front. Warranty usually works different in Malaysia compared to what you are used to. If you get worldwide guarantee on the product then it is ok. We have had bad experiences with small products like USB drives. We bought two Corsair 16GB sticks once and both broke down within 2 months. In the end we didn’t get any new ones, and after 6 months we are still waiting for the official report. The best way to buy at Plaza Low Yat as a tourist is by registering at the huge Low Yat Forums . Here thousands of store employees sell their stuff via the forums. The only thing you do is to come to a good price and then you make an appointment somewhere at Low Yat Plaza to pick up the product. You will get much cheaper prices as the store employees are selling you the product with their store discount. You have a cheaper price and they get a small margin on the sale. A good place to meet up is at the Starbucks or Coffee Bean in front of Low Yat Plaza; it also saves you the trouble of having to find the specific store. The mall is located between Jalan Bukit Bintang and Jalan IMBI, in the city center of Kuala Lumpur. If you are not that acquainted in Kuala Lumpur, this mall can be quite difficult to find. If you are coming from the direction of Starhill Gallery, Fahrenheit88, Pavilion KL or Lot10, just walk past the main entrance of BB Plaza (you can also walk through BB Plaza, and leave from the back entrance) and then go left into Jalan Bulan. If you’re coming from Berjaya Times Square, take the pedestrian bridge to just cross the road, and walk pass Plaza IMBI through the small street Jalan Bulan.